universal part // Zeibe Moto Motorcycle Leather Jacket Cleaning Pack Zeibe Cleaner 1x150ml and Protector 1x100ml The Perfect Gift Set for Motorcycle Riders! The Zeibe Leather Pack contains Leather Cleaner, a technical cream to clean and hydrate motor biker leather jackets, trousers and suits (plus information about cleaning and hydrating your leather jacket), and Leather Protector spray, a technical waterproof for motor biker leather jackets, trousers and suits (plus information about waterproofing your leather jacket). 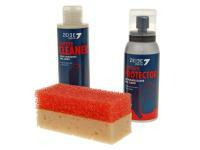 The leather protector, an impregnating spray, then seals the leather surface and protects against moisture and rain.